Join us 4 August at Love Romances Cafe for an all-day publishing house exclusive! Several authors and myself from Tirgearr Publishing will be hosted in this publishing house exclusive. And one of our editors, Troy Lambert, who will be there to answer questions about the editing process. Our authors will be available to answer questions about their work -- what's out, what's coming up, and whatever else comes up. Tirgearr Publishing will be on hand to answer your questions about who we are and what we do, and also about the submission process, and anything else you want to know. We'd love to see you all there. This is an all day event, but if you miss us, we'll be back at LRC on 8 October to do it all over again, and to include some of our other authors. If you have any starter questions for our authors or for Tirgearr Publishing, please email me at info@tirgearrpublishing.com with your questions. We'll post them on the LRC group on Sunday with our replies. Please note that membership at LRC is required, but it's free. Let me know if you have any questions about this event. A gothic novel of mystery, romance — and pockets! Follow cousins Alice and Lizzie as they are kidnapped from Lord Mangrove’s funeral cortege, spirited away by highwaymen, then sold to nefarious seamen until they’re captured by pirates without so much as an improving book to read! Log into Kit's page on Tirgearr Publishing for an excerpt. Visit Kit at Heart of Fiction through the weekend (26, 27 and 28 July). 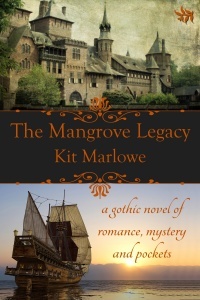 Leave a comment or question with your email address, and enter a chance to win a free copy of The Mangrove Legacy or an Amazon gift card. Details on Heart of Fiction.